Simle Middle School opened in 1961. By 1960, the city had over 27,000 citizens, and its aging public facilities were becoming inadequate. Even the twenty-six year old Capitol was becoming inadequate to serve as the state’s government center, and area schools, in particular, were no longer adequate to handle the demands of the growing population. 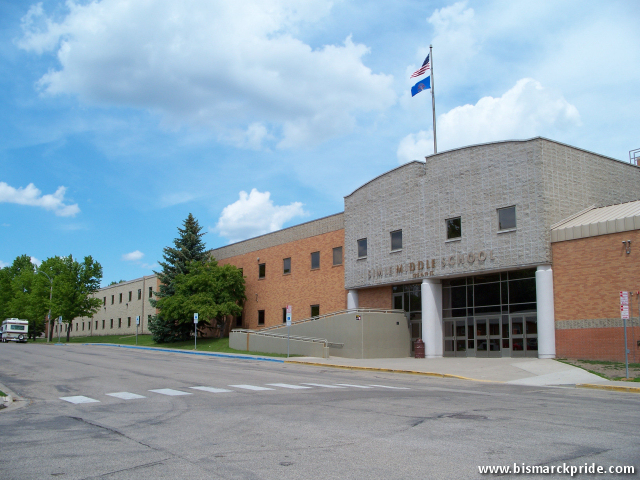 The city authorized the construction of two new junior highs to replace the 1912-built junior high building that had originally housed the high school. Hughes Junior High opened in 1958, followed shortly thereafter by Hillside Park Junior High (renamed Simle the following year) in 1962. The Dakota Zoo opened on June 3, 1961 on fifteen acres of land inside Riverside Park (AKA Sertoma Park), along the banks of the Missouri River. When it opened, the zoo was home to 75 mammals and 23 birds. Forty thousands visitors, each paying ten cents, came to the zoo its first year. Today, the Dakota Zoo sees more than one hundred thousand visitors each year to view more than 125 species of mammals and birds. For decades, the zoo’s main attraction was the world’s largest Kodiak bear in captivity, Clyde. Constructed at a cost of $1.3 million, the Holiday Inn was completed in 1962 near the Liberty Memorial Bridge. At 108 rooms, the hotel was the largest in the city at the time. It contained a lounge and restaurant, and also the largest banquet facilities in the city. The Holiday Inn was the first modern-day hotel constructed in the city, including being the first Bismarck hotel to feature an indoor swimming pool. The Holiday Inn provided significant competition to the Patterson Hotel and Grand Pacific Hotel, which were both over fifty years old and in a decaying state. The Bismarck Holiday Inn was one of the most successful hotels in the chain at the time. The sales director during the hotel’s golden age, Dan Mayer, was recognized at the chain’s corporate headquarters on numerous occasions, and the hotel itself was featured in several major magazines. The hotel was so successful that several additions would follow its initial construction, the biggest being a six-story tower added in 1972, giving the hotel a total of 261 rooms, more than doubling the room count. The Holiday Inn sparked major development in the area surrounding the building. Due partially to its location near Sertoma Park, the land surrounding the hotel quickly became one of the city’s most prestigious neighborhoods. A large apartment complex was also completed in the area in 1970, which at the time was considered extremely upscale due to its prime location and indoor pool. By the end of the decade, the area was home to other apartment buildings, in addition to a gas station and numerous houses. A new public library, Veteran’s Memorial Public Library, opened in 1963, replacing Carnegie Library, which had opened in 1918 through funding provided by Andrew Carnegie. Veteran’s Public Library underwent major renovation and expansion in 1989, and again saw minor renovation completed in 2010. William Guy Federal Building, opened 1964. A new federal building, later named for William Guy, was constructed in 1964 to supplement the original 1913-built Federal Building located on the corner of 3rd Street & Broadway Avenue. Both Federal Buildings still house federal offices to this day. Scotty’s Drive-in opened in 1965. 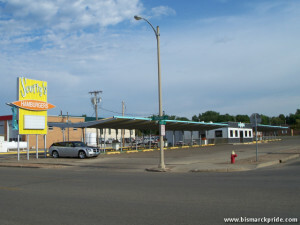 Scotty’s Drive-in, then part of a large regional chain, opened its Bismarck restaurant in 1965, becoming Bismarck’s second drive-in. The Bismarck Scotty’s is now one of only four survivors of the chain. Major change for Bismarck came with the completion of Interstate 94 in 1965. 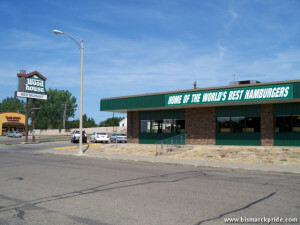 Up to that point, U.S. Highway 10, known as Main Avenue through Bismarck, served as the main eastbound highway through the area, bringing heavy traffic into the heart of Bismarck. Interstate 94 diverted all through traffic to the north, and created a second vehicular bridge across the Missouri River, Grant Marsh Bridge. Interstate 94 was undeniably the first major strike against downtown Bismarck. At the time the interstate was completed, there had been practically no development north of Divide Avenue. The point where the interstate bisects U.S. Highway 83 would eventually become a major business corridor, but it wouldn’t take place until the end of the next decade. The diverted traffic greatly affected businesses in downtown Bismarck, including the Patterson and Grand Pacific Hotels, who were already feeling the strain from the newly opened Holiday Inn. These once glamorous hotels quickly lost their competitiveness and quickly deteriorated. The worst snow storm in recent memory arrived in March 1966, burying the city. The storm lasted four days, from Wednesday until Saturday. In the end, 22 inches of snow officially fell on the area. Three Northern Pacific Locomotives became stuck in the snow just outside the city. At least 5 deaths were recorded due to the storm. The Governor called a State of Emergency, and sent out the National Guard to assist in cleanup efforts. Although winter storms are a common occurrence for Bismarck residents, no storm since has been as impressive as the March 1966 Blizzard. The most recent large winter storms hit in April 1997, and again during the Winter of 2008-2009, neither of which topped the 1966 storm’s intensity. Several large-scale developments took place over the next couple years that were all, in some fashion or another, connected to the Wachter Family, who’s business was quickly moving away from its farming roots. In 1967, Wachter Junior High opened. This was the second school named for the Wachters, who donated ten acres of land for the school’s development. 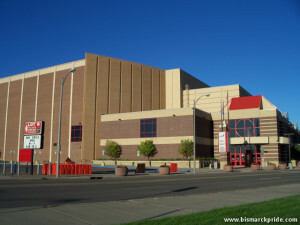 The Bismarck Civic Center opened in 1969. 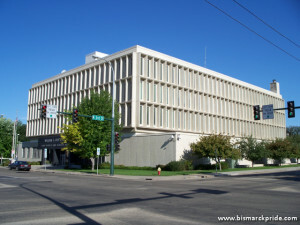 The Bismarck Civic Center opened two years later, in 1969, also on land partially donated by the Wachters. At one point, the Wachters owned most of the land south of the railroad tracks, but following the completion of the Garrison Dam, they were steadily moving from farmers to becoming one of the richest families to ever reside within the state. Unknown to most at the time, Paul Wachter had a major development plan in the works that would forever change Bismarck. King’s Food Host, now The Woodhouse Restaurant, arrived in 1969 with their famous Cheese Frenchees. At the time, King’s was one of the largest restaurant chains in the country, with locations in seventeen states and one Canadian Province. Today, The Woodhouse is the only remaining King’s location that still operates in the same format.